This year marks the 30th anniversary of my first visit to China. In 1988 I was in Guangzhou, about to embark on a solo journey to Beijing, when I was approached by a man from the Chinese Tourist Agency. He invited me to join the ‘first international cycling tour of China’. I found myself moving from the youth hostel to a very smart hotel where I joined an international group for a 3 week tour of China by bicycle, train and coach. 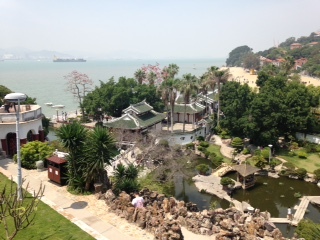 Now I am in Xiamen (pronounced Schamin) for the final Eastern lap of my sabbatical journey. This week, thanks to the efforts of my host Professor Yonghui Ma – a bioethicist at Xiamen University – an equally fortuitous happening occurred. I was invited to join another international group for the ‘the Global Humanities Festival’ on the theme of ‘Challenges and Duties of Humanities: Asian and Global Commitments’. 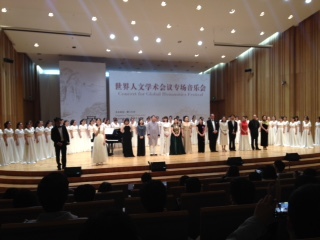 Festival participants were treated to an abundance of academic and cultural riches. Scholarly talks were given on topics as diverse as: the humanities as a resource for our changing world; what we can learn from ancient Chinese texts; the maritime Silk Road; rhetoric and the cultivation of oral skills; and ethics and emerging technologies. We had guided tours of the local South Putuo Temple, of Tan Kah Kee College, of Daimei historical village, of Gulangyu Island, and of medieval Quanzhou. We also had a wonderful concert with performances familiar (an extract from ‘the Merry Widow’) and exotic (local music and instruments such as clay vossle flute, Chinese zither and dolcimer). The university choir was nothing short of sublime. Thanks to the committed leadership of Professor Hsiung Ping-Chen, President of Asian New Humanities Net (ANHN), the hospitality of Xiamen University and other centres we visited, our student helpers and the openness of participants, the Festival was an inspiring experience. My UK colleagues will be very familiar with a similar approach to nursing values – the 6 C’s of: care, compassion, competence, communication, courage and commitment and the seminal work by Simone Roach who detailed 5 C’s of caring: commitment, conscience, competence, compassion and confidence (see, for example, https://online.stmary.edu/rn-bsn/resources/the-5-cs-of-caring). Some years ago, I wrote about the ‘tsumani’ of values that nurses and other professionals had to negotiate. The discussion as to which values and why, does and should continue. So a question for you: which list of values do you think is the better fit for professional life – Professor Ho’s qualities? Or the 5 or 6 C’s identified for caring? or some other set of values? In another engaging talk, American Professor David Schaberg gave his rationale for reading Chinese Classics. He talked of the value of these ancient stories, of the morality underpinning them and of their role in helping us to close distance – both culturally and across time. He suggested that we may find that figures who feature in these early stories are more like us than we thought. Recently, I listened to a Radio 4 programme about identity in Northern Ireland. The programme presenter referred to ‘them’uns’ and ‘us’uns’. By ‘them ‘uns’ (them ones) he meant people who are different to ‘us’ and by ‘us’uns’ (us ones) he meant people who are like ‘us’. Having been brought up near the Northern Irish border and having worked in Belfast during ‘the Troubles’, I knew exactly what he meant. In that context difference related primarily to religion, culture and political sympathies. Catholics, it was thought, could be counted on to favour a United Ireland and to promote Irish culture and language. Protestants, it was assumed, were loyal to the Union with the mainland of Britain and committed to enacting Loyalist traditions. Scholarship on inter-sectionality, referred to in blogs from Alabama, challenges the ‘them-un’s and ‘us-uns’ mentality. We are not just one thing or another but rather a complex mix of ingredients such as race, class, culture, gender, sexual orientation, age and, of course, history and geography. We need to be wary of stereotypes and biases and take time to appreciate the complexity and colour of different cultures. When I first came to China 3 decades ago, I was struck by the fact that people’s uniform clothing was generally dark. This time – and on a recent visit to Shanghai – I am impressed by the vibrant colours of clothing, most particularly of the women. 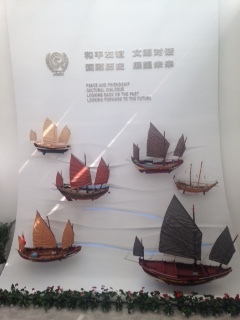 China is also not one thing or another but rather a fascinating mix of cultures, histories, politics and philosophies. A mix that requires insights from, and engagement with, the humanities. It is not hard, then, to see the value of the Global Humanities Festival which I have been privileged to experience this week. In the coming week, I will be giving talks in the School of Nursing on the themes of ‘Dignity in Care’ and ‘Writing for Publication’. I look forward to having the perspectives of those who attend. I’ll tell you how it goes next week.